This is my first post with Cook the Books Club, a book club that reads books about food. 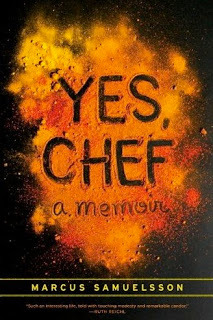 This month the book chosen was Yes, Chef by Marcus Samuelsson. The book is a memoir about the man who became the youngest chef to receive a three star rating from the New York Times. He has an interesting story to tell, as he was born in Ethiopia and adopted by Swedish parents when he was young. The story goes (mostly) up from there, where he has a pretty typical childhood with loving family. When he finishes his schooling in Sweden, he travels worldwide to learn to cook in various venues. I would say he is classically trained, given the caliber of restaurants where he's worked. He ends up in New York City, where he owns Red Rooster Restaurant in Harlem. My favorite quote in the book is this: “A hundred years ago,” he says, “black men and women had to fight to get out of the kitchen. These days, we have to fight to get in." I haven't had the opportunity to try much food from Ethiopia, but the Chef talks a lot about using a spice blend called berbere. That's where I decided to get inspired! Berbere is a spice blend made of chili powder, garlic, ginger, basil, and a lot of spices I don't normally use, such basil, korarima, rue, ajwain or radhuni, nigella, and fenugreek. Say that fast three times! • Blend a can of tomato paste with honey, salt and as much berbere as you can handle. It makes the best barbecue sauce. Ever. • Sprinkle just a bit into the cheese sauce of your favorite mac and cheese. The smoky, spicy change will blow you away. • Use it straight up as a dry rub for baby back ribs, steaks on the grill — even for oven-roasted chicken. • Sauté minced onions and garlic with vegetable oil, stirring in berbere. Thin with more oil or with broth, then use as a marinade. • Blend with softened butter then spread over hot-off-the-grill corn on the cob. Or add minced garlic and use for garlic bread. • Add a bit to the pot when browning meat for a beef stew. Or sprinkle just a pinch over a bowl of chicken soup. • Mix just a bit into prepared pasta sauce, or mix it directly into meatballs. • Add a bit to ground beef when browning it for tacos. I was very inspired to give this seasoning a try. Since it is a very spicy seasoning, I thought I would give it a try with eggs, one of my go to ingredients when trying something new. I threw together this omelet for lunch and it was A M A Z I N G.
Whip the eggs with a little water until foamy. Heat the olive oil in a medium frying pan until warm. Add vegetables, stir until heated through. Reduce heat to medium, and add eggs. Salt and pepper. Gently push cooked eggs toward the center of the pan, inverting the pan so that the uncooked eggs come toward the sides of the pan. Continue this process until eggs are cooked. Sprinkle cheese onto one half of the eggs, then flip the other half on top of the cheese. Turn off heat and allow cheese to melt. Sprinkle with berbere sparingly until you know what heat level you can deal with! I like my omelets rustic, not perfect! I loved the smoky heat that this spice added to my rather generic omelet. It is something I will be using more of in the future. Berbere seasoning added at the end. Smoky, hot, delicious! I highly recommend this book for those of you foodies who love to hear about what makes a chef a chef. If you'd like to join the Cook the Books Club, click on this link. It was very fun to be a part of this group!